Speaking with fellow Nintendo veteran Satoru Iwata, legendary designer Shigeru Miyamoto admitted that he carried a tape measure around with him at all times so that he could measure things. In the latest installment of "Iwata Asks", Nintendo President and CEO Satoru Iwata spoke about Wii Fit Plus and its ability to, say, keep track of your dog's weight in case Fifi needs to get more exercise and stop chowing down on the doggie biscuits. During the conversation, the Nintendo guru mentioned his fondness for weighing and measuring objects, suggesting that Wii Fit Plus could be used to "weigh the objects around you and have a lot of fun that way..."
Miyamoto: I've always enjoyed guessing the lengths of objects, which is why I carry a measuring tape around with me. Iwata: Really? That one's new to me too! Miyamoto: For instance, I might guess that the table in front of us is about 1.2 metres long. Then I'd actually measure it with the measuring tape to check. If I got it right, I'd think: "I'm on form today!" But if I missed the mark by a long way, I'd think: "I've been slipping a bit recently!" Nor is it just measuring the length of objects - good ol' Shiggy likes guessing what things weigh, too. Unfortunately, that's slightly more difficult to pursue, since "you don't find scales all that commonly, which makes it very difficult to check the weights of objects." And that's why they made the Wii Fit Plus, folks. 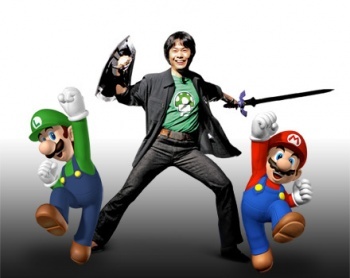 So Shigeru Miyamoto can guess the weight of something at any time he wants to.